Who is the first to find out Kang Woo does not exist? And plus, we finally find out who is the real murderer!!! We come back to Jae Yul leaving for a few days’ stay at his old house. Hae Soo is pissed off by this whole thing but misses him immensely and even sleeps in his bathtub. Jae Yul also miss her a lot, unable to work, but neither makes contact. At the prison, Dong Min is finally administering the amytal to Jae Bum, but warns Jae Beom that he cannot tell the results to anyone because the amytal is for treatment, not for criminal investigation. Meanwhile, Jae Yul meets with PD Choi and asks him if he could clear Jae Beom’s name through some investigation, but you know, to not show up in front of Hae Soo. Choi, of course, is suddenly super invested in Hae Soo’s well being and declares that he won’t stay away until he is sure Jae Yul is a safe guy. The two end up in a fist fight and Choi trips over a stack of milk crates, falling to the ground and hitting his head. Back at the prison, Jae Bum is under the amytal and he starts to talk about how Jae Yul and their mom always got along so well. 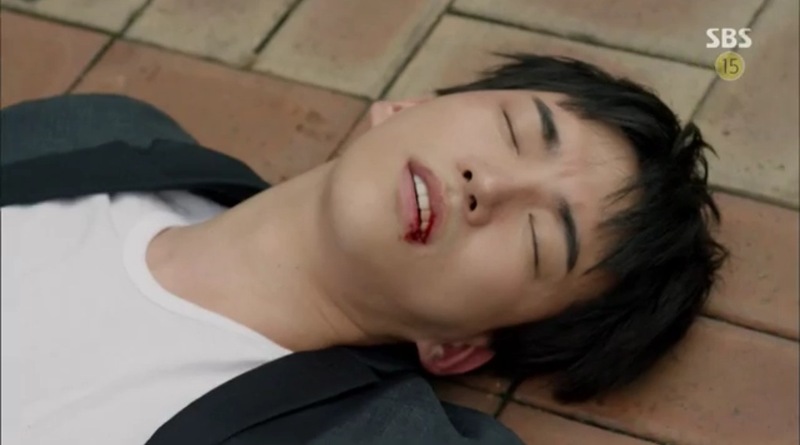 On the day of the murder, Jae Yul was getting beat up by the step dad so Jae Bum intervened. While Jae Bum is getting beat up, Jae Yul grabbed the knife on the coffee table and walked toward the step dad. In that moment, step dad fell back wards into the knife, pushing Jae Yul into the dresser cabinet, knocking him unconscious. So Jae Yul is the one who accidentally killed the step dad. At the hospital, Hae Soo stops a patient from killing himself in the bathroom. The patient eventually gives her the weapon and falls asleep while hugging the toilet. She remembers seeing Jae Yul sleeping in the bathroom and instructs everyone to let the patient sleep there for a while. Even though he claims everything is over, Soo Kwang is still being very considerate to So Nyeo. 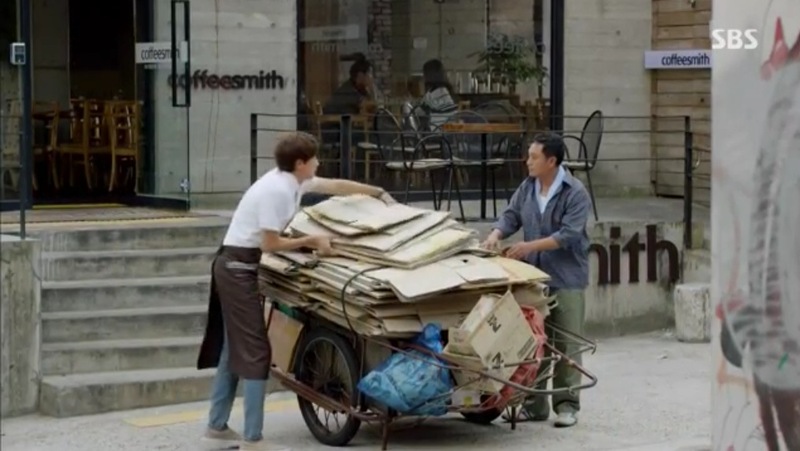 He brings out large piles of cardboard for So Nyeo’s dad and instructs the dad to take the cardboard to recycling to earn money. So Nyeo witnesses this and inquires, but Soo Kwang pretends like he doesn’t know her. Instead, he walks past her to bring ice and water to PD Choi. A little while later, Jae Yul goes to meet Kang Woo (who never goes to school in Jae Yul’s mind), and Choi gets a call to meet the lawyer who was involved with the case. Kang Woo asks Jae Yul what he thinks of the writing, and Jae Yul gives him affirmation. Soo Kwang passes by the window and is confused by who Jae Yul is talking to. Now back to the prison again, Jae Bum is awake from the amytal. He is actually the one who volunteered to take Jae Yul’s place, thinking that he will just be sentenced for two to three years. In the end the judge sentenced him to eleven years so he blurted out the truth, but Jae Yul and their mom still said Jae Bum is the murderer, so he felt betrayed. Jae Yul comes back to the house to pick up his stuff and sees Dong Min reading one of his books. Dong Min also notices the lock on Jae Yul’s bathroom door and seems to have come to some sort of conclusion about the situation. Just then, Hae Soo comes in and Dong Min leaves. Hae Soo asks Jae Yul to stay, but he refuses, so she remains angry. In Dong Min’s office, he talks to Young Jin about the Jae Yul/Jae Bum case without revealing their identity. He is unsure why Jae Yul gave false testimony especially since Jae Yul has such deep affections for his brother. Young Jin states that regardless giving false testimony is a crime, but Dong Min insists that his role is just that of a doctor, not a judge, so he is only interested in healing wounds and he thinks Jae Yul has a good chance since he has a great person (aka Hae Soo) next to him. In return for this story, Young Jin apologizes for using contraceptives during their marriage. Dong Min says it’s okay because he saw that she had great potential as a doctor, and that it would have been a life of looking after a child if she was not a doctor. He confesses that he does love her, but he needs to hold it back in order for their friendship to continue. Jae Yul listens to Hae Soo and sits down to eat. Hae Soo follows Dong Min to his office and the two discuss Jae Yul’s case. Hae Soo asks Dong Min to do an evaluation so they can treat Jae Yul. Meanwhile, Tae Yong is at the police station viewing the survillence video. He makes a trip to the house that Kang Woo supposedly live at and it is indeed empty. He calls up Jae Yul for Kang Woo’s number, pretending to be interested in Kang Woo’s writing. Tae Yong calls the number Jae Yul sends but the number does not exist. Hae Soo comes into Jae Yul’s room and the two talk about his moving situation. She expresses her worries for him when he is not around, and he softens. They make a plan to meet on Fridays and extend their dates to two days, staying over at his house for the night. Hae Soo also admits to being “too much” lately. Jae Yul visits Hae Soo’s mom’s store to show them some pictures of the trip. Hae Soo’s brother in law is jealous of the way mom treats Jae Yul and voices his opinion on the situation by saying no one marries after a trip anymore. Hae Soo’s mom immediately becomes alert and the brother in law presses Jae Yul to answer if he plans on marrying Hae Soo or not. Jae Yul does not answer. Hae Soo rushes to the SBC studio to sit in the panel on Jae Yul’s show. They enter the elevator and she reaches to kiss him but he turns her away noting that there is a survillence camera. They exit the elevator and he tells her that people do not know about their dating relationship. She remembers what her sister said about Jae Yul being a player and asks Jae Yul why he has not told anyone. He replies that he is too lazy to explain which rises more suspicion. She asks out right what he means by being too lazy to explain, is it because he plans on breaking up with her? She says she is either the woman he plans on marrying or the woman he will break up with. This leaves him speechless and she pushes for an answer. He finally answers that he has nothing to say because she is absolutely right. I really love this drama, I really do, but I can’t shake the feeling that it is starting to drag a bit. No longer am I jumping to see it available on my ipad to watch 😦 The characters are still great and the acting is still as superb, but there seems to be much lacking now that the story is moving forward at the snail’s pace. Maybe it is because Jae Yul and Hae Soo went through all the motions so quickly that there isn’t much left to their “getting together” story which usually takes up the bulk of a drama. I mean sure they still have a rather tall hill to climb, but they are so comfortable together that it is almost a bit boring watching them. Yes, I still think they are cute and absolutely adorbs, but at the same time its like watching your friends, at first its cute then it gets to be like okay enough! Where’s the excitement? Jae Bum has been kind of providing some of that but we still got at least six more episodes to go and he has already tried to hurt Jae Yul at least two times. The same trick can only be played so many times, so where is this story going to go? Maybe now that Tae Yong is aware of the nonexistence of Kang Woo we can get Jae Yul to face the music and realize he has issues to work through. Perhaps the next six episodes will focus on Hae Soo and Jae Yul overcoming this hurdle, but for some reason I don’t find myself anticipating it too much. It’s good, but it lost some of its charm way too quickly from shooting through seven or eight episodes like it was yesterday’s lunch. What will it cook up next? I guess we will have to wait and see. A strange part of me is not so convinced by their love anymore. I almost like Dong Min and Young Jin’s version of love story more and more; it’s weird.